But it will only be available from AT&T. It will also not feature any of the improvements found in the international versions of the handset. 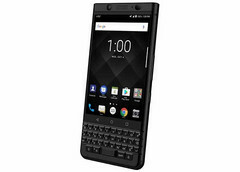 The Blackberry KEYone was generally heralded as a return to form for the once-great mobile company, but not everyone was excited about the phone's color scheme. Black and silver may look nice to some, but others were hoping for an all-black design reminiscent of old-school Blackberry phones. Today, AT&T has revealed that it will be the exclusive carrier of such a device in the US. This Space Black version of the KEYone first debuted in India and brought some improved specs along with it. The 3 GB of RAM found in the standard model was bumped up to 4 GB, and storage was doubled from 32 to 64 GB. Unfortunately, none of those improvements are making the trip to the States. Instead, all we get is a shiny new coat of paint. It is a nice looking coat of paint, though. AT&T is launching the new KEYone on September 1. The phone costs US$16.67 per month over a period of 30 months, which translates to $500 if paid upfront, although that type of purchase option has not been mentioned by AT&T yet.